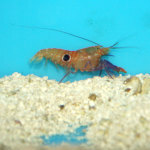 Skyrocketing in popularity over the past few years, Mantis Shrimp have gone from nuisance invaders to a specialty aquarium niche all their own (and a new superstar among viral animal posts thanks to comedic websites like The Oatmeal and zefrank’s YouTube videos). 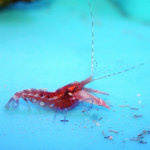 By far, the most popular of these crustaceans is the Peacock Mantis Shrimp, Odontodactylus scyllarus, but there are many other species that are just as fascinating and deserving of attention. 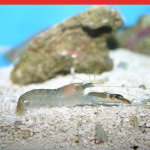 We’ve featured mantis shrimp in general in several previous blogs; in this entry, we’ll investigate some of those other mantis shrimp that you may not hear about or see as much in media. Its name may not be too familiar, but this mantis is one of the most photographed species due to its trademark meral spot. As you may remember your mantis shrimp anatomy from our other posts, the “meral spot” is a pair of false eyespots on the mantis’s raptoral appendages (the gonna-hurt-you limbs). If you held your arms in front of you, the meral spots would be on the inner sides of your elbows. The Smith’s Mantis Shrimp is well known for these spots because they are some of the most easily-identifiable: bright purple with a defined white outline. They give the Smith’s Mantis Shrimp its other common name, the Purple-spotted Mantis Shrimp. The body color of the Smith’s Mantis Shrimp is otherwise pretty similar to the Peacock Mantis, often bright blue-green and sometimes with red trim to each body segment. This species is a “smasher” and while it isn’t available as often as some other species, it is very sought-after by collectors when it is. This is one of the most common mantis shrimp that we receive at our store and is one of the best suited for aquarium life. It is the largest of the Gonodactylus genus of “smashers” but still only reaches about four inches in length. 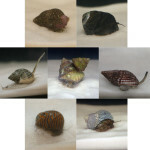 Unlike many other species, it is pretty easy to tell the difference between males and females. 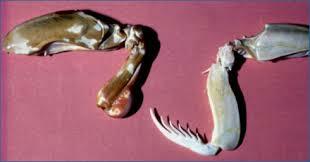 Male Chiragra Mantis Shrimp are usually blue-green in color while females are a mottled tan and cream. Both genders have a white meral spot that is far less obvious than the Smith’s. The most distinctive feature of this species regardless of gender is the light-colored sprinkles on the front corners of the carapace in the same place as the Peacock Mantis’s distinctive leopard spots. This is one of my favorites. 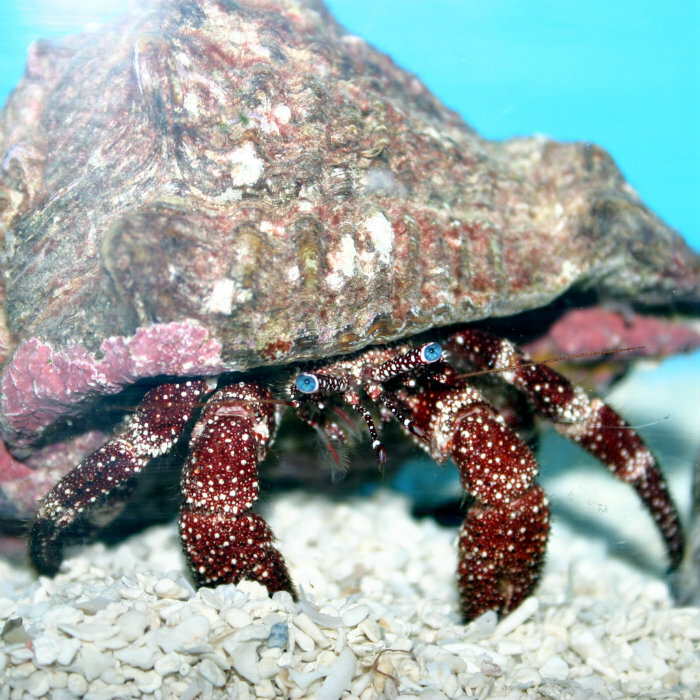 Not only is it a “spearer” when most of the more common species are “smashers” but they have one of the coolest defining traits…checkerboard eyes. 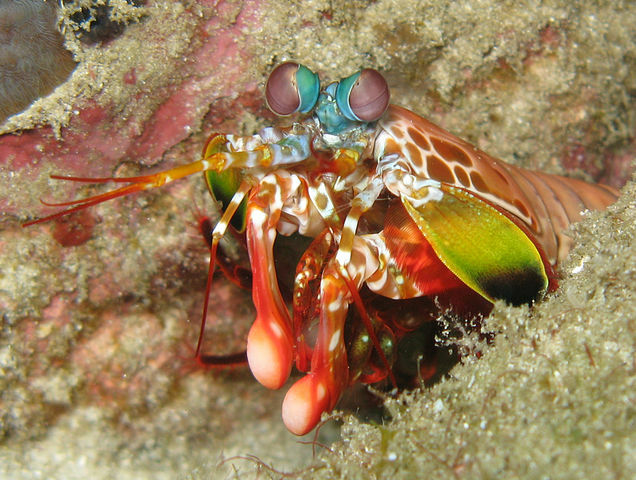 All mantis shrimp have extremely complex eyes and three different “sections” can be seen on most of them. The Ciliata Mantis Shrimp also has vertical lines overlaying the horizontal segments so their eyes, if you can get close enough to see it, have a checkerboard-like plaid pattern on them. 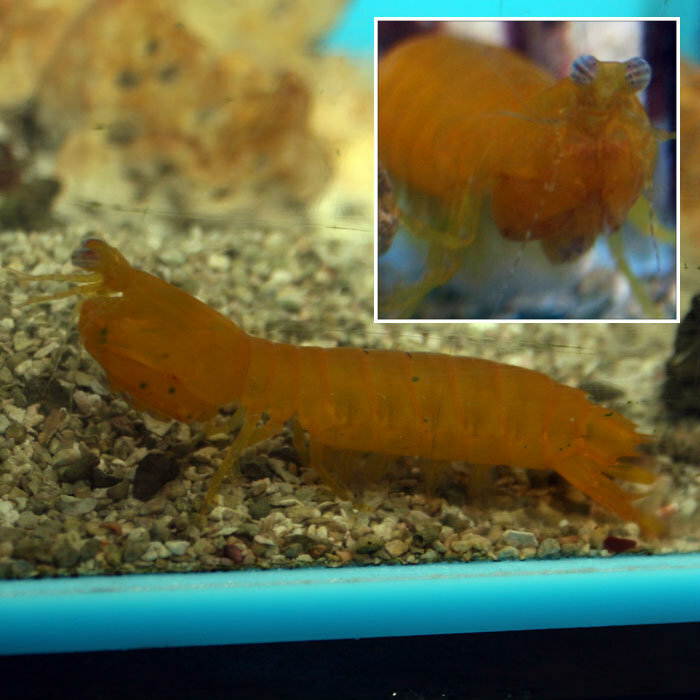 Most of the Ciliata Mantis Shrimp you’ll see in the aquarium trade are green or yellow but their color and even pattern can change every time they molt depending on their environment and the lighting. 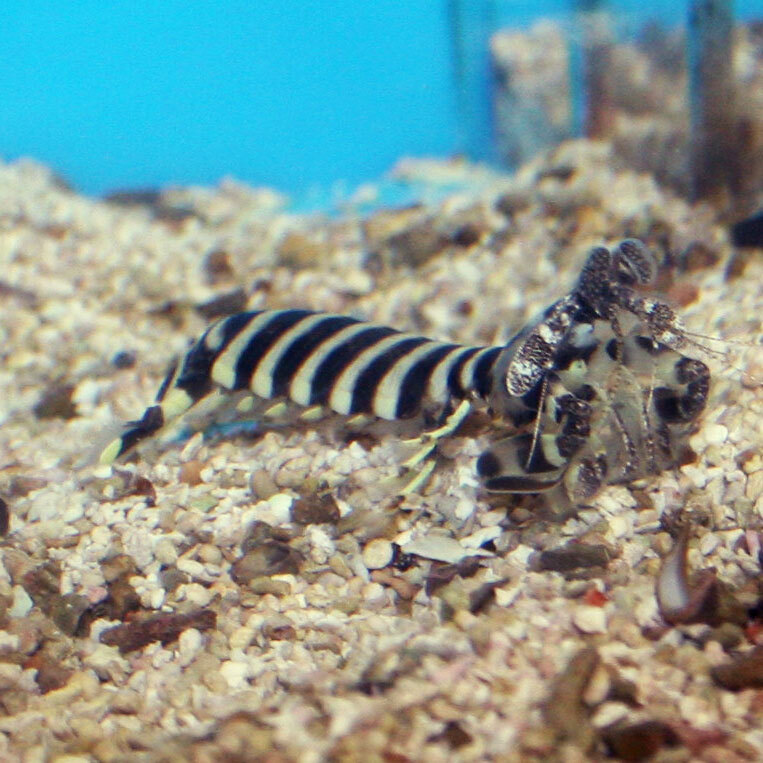 It is easy to see where the Zebra Mantis Shrimp gets its name. It has alternating black and cream-colored stripes. It also has white speckled antennal scales and eyes. However, it is unique in that, like the Ciliata Mantis, the Zebra Mantis is a “spearer”. Rather than hiding in rockwork caves like most “smashers”, these mantis shrimp will build deep burrows in the sand or substrate, reinforced with mucus, where they wait to ambush their prey. This species also has the distinction of being the largest of all mantis shrimp. 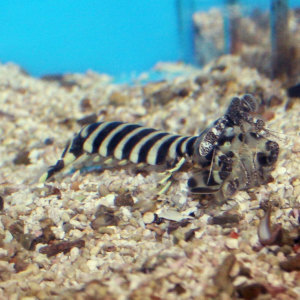 While most of the Zebra Mantis Shrimp that you’ll find available to aquarists aren’t much larger than any other species available yet, they can grow to over fifteen inches in length! 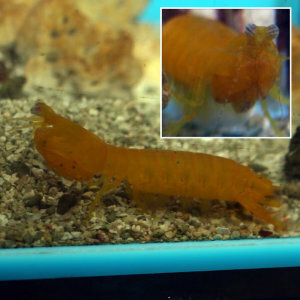 Several mantis shrimp with bright orange meral spots are also sometimes available. Two of these, Gonodactylaceus glabrous and Gonodactylaceus graphurus are almost identical and can be hardy, fun mantis shrimp to keep. A third, Gonodactylaceus ternatensis, is a less suitable choice. When small, this mantis shrimp looks like a juvenile Peacock Mantis but is often found living within coral heads. To collect it, the heads are often broken and destroyed. With all of the other species available, please avoid G. ternatensis and stick with the species collected with safer, less destructive methods! 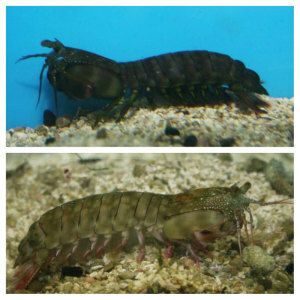 These are just a few of the more common mantis shrimp other than a Peacock Mantis Shrimp but there are many other species that become available from time to time. 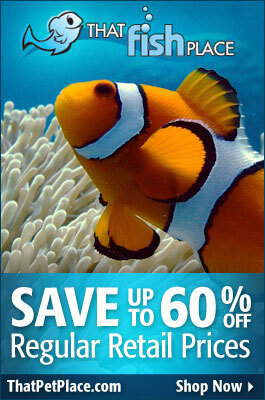 So, don’t limit yourself if you are brave enough to head down the road to try these cool creatures! 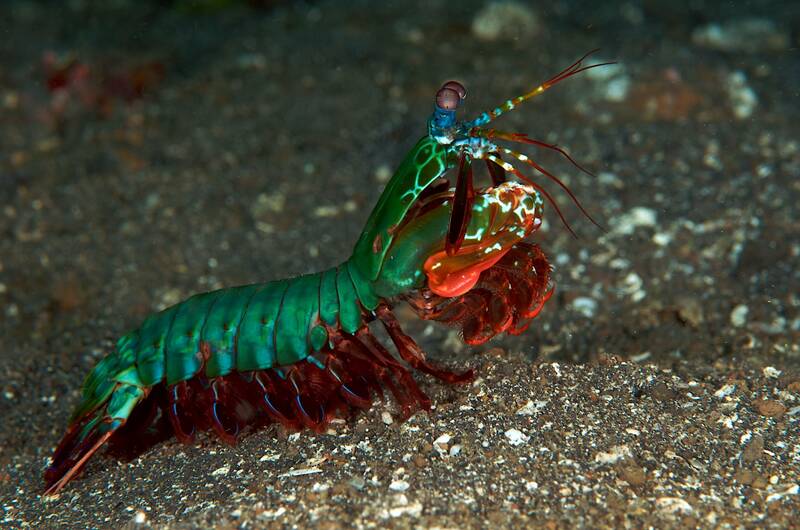 The Mantis Shrimp, fabled ocean warrior and legend of internet Marine Biology humor (Thanks to The Oatmeal, and zefrank1) is the inspiration for research of new composite materials. There are many applications for high performance impact resistant composite materials, and scientists and engineers are always looking for ways to make materials stronger, lighter and more versatile. There is particular interest from the military and industry for stronger and lighter materials for armor, aircraft and automotive applications. 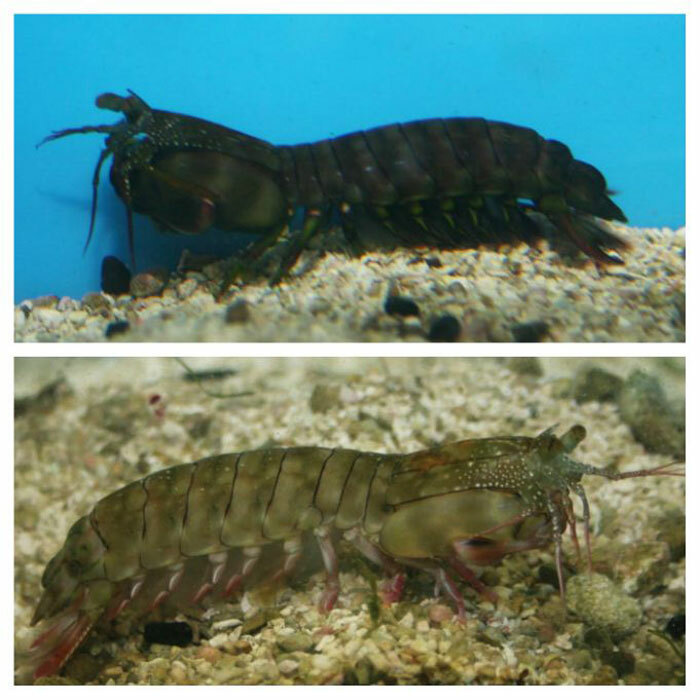 Why Study The Mantis Shrimp? 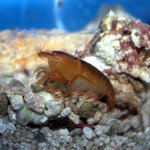 Most Reef Aquarium Keepers are aware of the hunting prowess of the mantis shrimp, and the weapons that they have developed to capture their prey. There are two main types of Mantis Shrimp, grouped by the form and function of their specialized set of second legs, called raptorial appendages. The Slasher or Stabber type of Mantis Shrimp have developed a sharp spear that it wields with Ninja like skill, earning it the nickname “Thumb Splitter” from fisherman who find them in their nets. The Second type of Mantis Shrimp is the Smasher, given its name for the club like weapon that it uses to kill prey and open the hard shells of mollusks, crustaceans and gastropods. It is the Smasher type of Mantis Shrimp that has scientists and engineers studying its design, looking for insight into designing lighter and stronger composite materials. 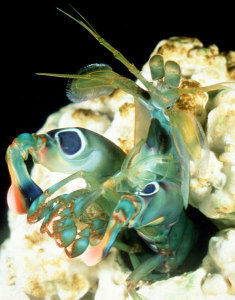 The Peacock Mantis Shrimp, Odontodactylus scyllarus, (which is actually neither a mantis, nor a shrimp) is a common species of Smasher Mantis Shrimp found in warm waters of the Indo Pacific and Indian Oceans. 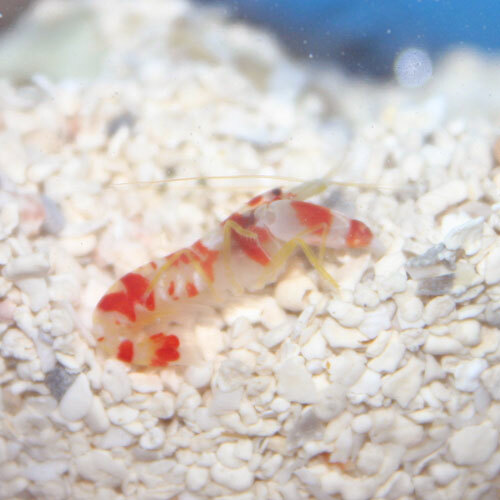 Sometimes kept by the more adventurous marine aquarium keeper, this little Stomatopod is an amazing combination of striking beauty, and ruthless hunter. The Peacock Mantis can fire its smasher club 50 times faster than the blink of a human eye, at the speed of a fired .22 caliber bullet. The Club fires so fast, and with so much force, that it actually boils the surrounding water in a process called supercavitation. The resulting strike and shock wave are devastating to their intended prey. 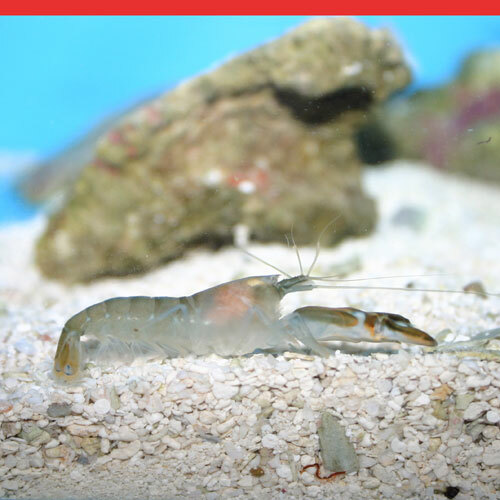 Mantis Shrimp have been known to break glass aquariums. 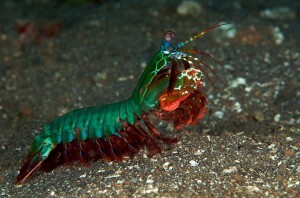 Chuck Norris punches with a wet noodle compared to the Peacock Mantis Shrimp. What has researchers so interested is the amazing durability of the Peacock Mantis Shrimps striking club. The Mantis can strike its club weapon thousands of times, with a striking force more than 1000 times its own weight without breaking. 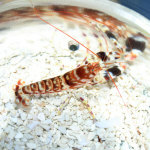 In a recently published study “Bio-Inspired Impact-Resistant Composites” in the Journal Acta Biomateriala, a team of researchers led by University of California, Riverside, in collaboration with University of Southern California and Purdue University studied the structure of the Mantis Shrimp’s smashing club. The team was looking for design elements that could potentially be used to improve industrial composite materials that are used in things like; aircraft, military armor, protective helmets and automotive panels. What they found in studying the Peacock Mantis Shrimps Club structure was a helicoidal arrangement of mineralized fibers, which made the club incredibly impact resistant and energy absorbing. They then applied this design architecture into carbon fiber-epoxy composite impact materials, and tested the performance against similar composite materials used in the airline industry. The results showed improvement in the overall material toughness, with real promise for manufacturing in the future. The Mantis Shrimp research showed so much promise, that the research group has been awarded a 7.5 Million dollar grant from the Department of Defense to continue their research. Ongoing research will include looking at structural designs of more than 20 organisms, like bird’s beaks, snail shells, antlers of mammals and others. All of which are made from relatively simple biological materials like Chitin and Keratin, yet show incredible mechanical durability. You can read more about the team and their research on the UC Riverside website. Does anyone else have an image in their heads of a military decked out in Peacock Mantis Shrimp armor, driving Mantis Smasher vehicles? No, well you should, that would be awesome.